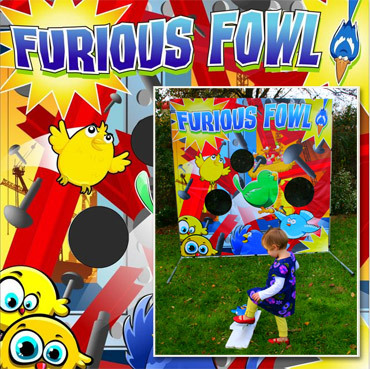 If the kids love birds with attitude problems, try the Furious Fowl Carnival Game. Use the foot catapult to launch the birds into the holes in the backdrop! Contents: Furious fowl themed back drop, foot catapult, birtds. Standard Carnival Rules: Lauch the birds with the foot catapult and try to get them in the backdrop holes.